My little guy is enamored with Thomas the Train, so I naturally looked for a costume for Halloween. I wasn't impressed with the sandwich board style ones available in stores, so I did a little research online and found several fun, homemade examples online. I decided to make my own costume, as well as a tutorial for the rest of you parents trying to please your little Thomas enthusiasts. 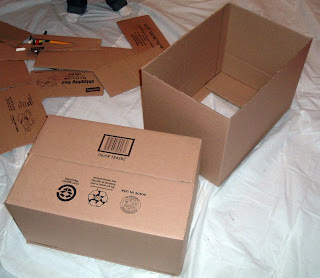 You need two boxes and a third box to use for additional pieces. Put the first box together, using hot glue to close the flaps (you don't want to use packing tape, as the paint won't stick to it later). This will be the main part of the train. 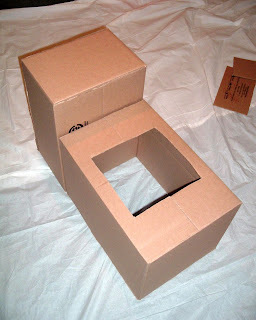 The second box needs to be thinner, so trim the body of it down about 4 inches before shutting the flaps. This is the back part of the train. 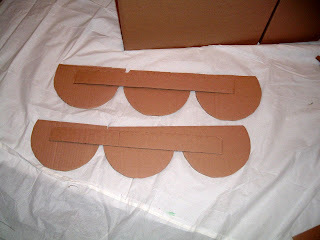 I cut a piece from the third box to glue over the backside, so there would be no seam on the back of the train. You can see in the second picture how I cut out an opening in the first box. 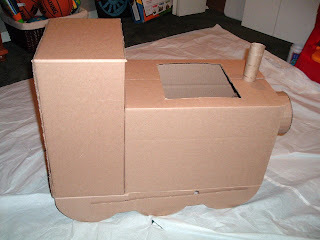 This is where your little person will be as he/she "rides" the train, so cut it to fit. 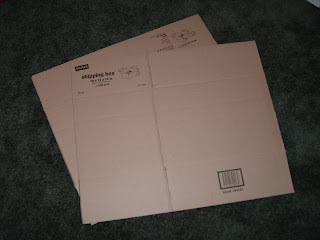 Cut the flaps off the bottom part of the first box. Your child's feet will come out the bottom. 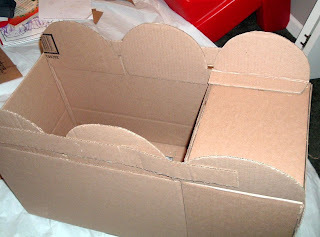 Next, glue the second box onto the back of the first box, so that it sticks out higher than the first train. The next step is to cut out the train wheels. I used the third box and a salad plate as a template. I also cut a long strip to connect the wheels. I'm not sure what this is called, but you see it on the real Thomas' wheels :). Glue the wheels onto the body of the train. I overlapped the wheels on the underside of the train by a couple of inches. At the back of the train, where the second box is, I folded the wheel under a couple of inches and glued it. The final step in the contruction phase is to make Thomas' head and smokestack. In my research, I saw that many people used premade containers like oatmeal canisters for the head. I thought this looked too small for the scale of the train, but you may be able to find a bigger cylinder. I decided to make my own. 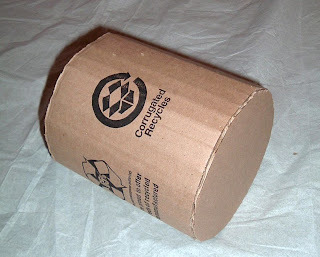 I used a bowl to trace and cut out a circle, and then I used a strip of cardboard to wrap around the circle (I also cut a slightly smaller circle to fit inside the cylinder a few inches down to stabilize it). Use the hot glue to secure. 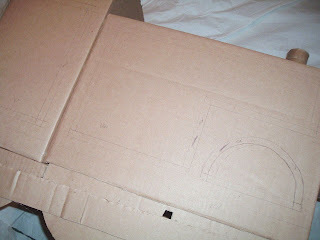 Trace around the cylinder on the front of the train, and use an X-acto knife to cut out the circle. Shove the cylinder through the circle. You want a tight fit. 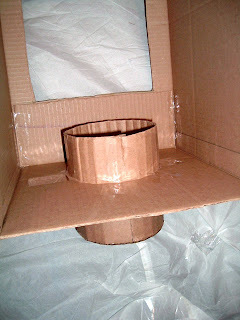 Then use packing tape to secure the cylinder on the inside of the train. Follow the same steps for the smokestack. I used a papertowel roll cut in half. The only difference from the head is that I secured the smokestack on the inside by cutting the tube lenth-wise several times on the inside of the train and folding those pieces outward. I taped them to the inside of the train. 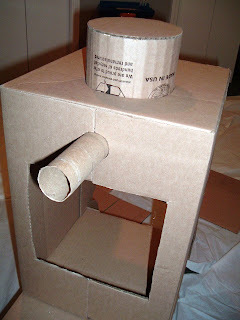 Now you have your Thomas costume constructed. At this point I used a ruler and sketched out where I wanted the lines to go. Do this with a light hand. Some of my lines and color notes were hard to cover with paint later. You can find Part 2 of the tutorial here. 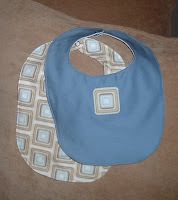 Check out Amy Karol's bend-the-rules Sewing for an easy, cute pattern for baby bibs. I got on a bit of a kick and made a bunch last week. They are a great way to use fat quarters. 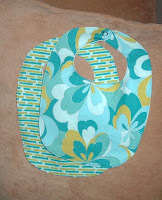 They'd be fabulous baby shower gifts too - so vibrant and fun. I fiddled with the pattern later though, and enlarged it to fit toddlers. 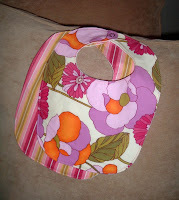 I found baby bibs pretty useless once my little guy was about a year old - just when he was the messiest eater. You need more coverage, you know? I couldn't find any larger bibs in stores. 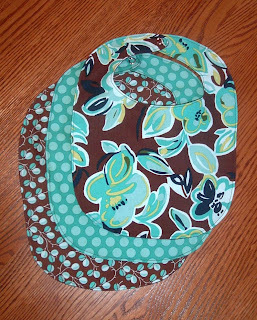 I've got a set of three toddler bibs in cute, coordinating fabric in my etsy shop if you need a great gift for the toddler, really for the toddler's mom, in your life.